We are the Gagnons (les Gagnons) in North Hero Vermont. We have lived here since 1999. We are surrounded by beautiful country and lake Champlain. We welcomed our two sons in 2000 and 2004. In 2007 we started our homesteading adventure with a little flock of hens. Then we brought in our first two boer goats Kelli and Taco. In 2008 we acquired our first Saanen dairy goats, Sunny and Breeze. Then came more goats, turkeys, ducks, and pigs. With these animals we have fed ourselves and our neighbors and family some of the best eggs, milk, cheese, chicken, turkey, goat meat and pork you can imagine. The last eight years have been a roller coaster adventure of successes and failures. By this time our experience has distilled in us an understanding of what we can do and what is too much, and some expertise in our little niche. US $10.00 per gallon, plus $5.00 bottle deposit. We sell milk in 1/2 gal Ball jars with plastic lids. If you want to bring your own container, no deposit is necessary. Sadie-I: Friendly 3-yo doe with a single buckling on. Sadie was born on Feb 29 2013, hence her name (Sadie Hawkins Day). Sadie and her sister are Bob's favorites. Her mom was Susannah and her pa was Bucky. Both registered ADGA, but we did not register Sadie. Sadie is a good milker with large easy teats. Sadie will produce about a gallon of milk per day. $250 with her buckling. SOLD!! Congratulations to her new family in Isle La Motte! We have 3 beautiful 2016 doelings for sale this year, $100 each. Picture to be added soon. 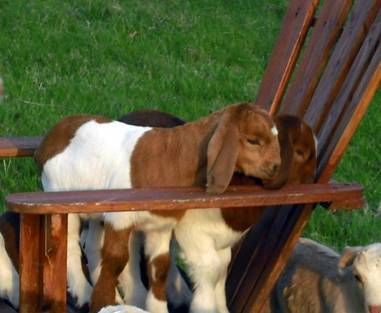 We have a variety of boer-kiko cross doelings and bucklings this year, in many different colors. Prices vary by animal. Being new to a homesteading lifestyle, we decided to raise goats for dairy and meat because we learned through a lot of research that pound-for-pound, goats are the most efficient livestock animal for converting grass/forage to food. Below are some links to websites where we have learned a lot about goat milk and raw milk. We are drinking our girls� milk every day, and making cheese, yogurt, butter, buttermilk and kefir. Truth be told, we were a little nervous at first that milk from our goats would not taste as �clean� as store-bought milk that we have been buying and enjoying for years. But we have found (happily) that our fresh goat milk tastes delicious! It is not appreciably different from grocery store milk: only fresher and richer. Because ours is fresh un-pasteurized milk, it is a LIVING FOOD. A similar comparison would be that of a raw apple to applesauce. The living food is replete with all its original vitamins and minerals, plus enzymes, pre- and probiotic we need for a healthy and efficient digestive system. As such, it will be tasty and good for us for a very long time. Compared to the cooked food (pasteurized), all of the beneficial living components have been cooked and killed. Some vitamins and minerals are still there (though in diminished quantities, and altered by heat), but the food, having lost its beneficial enzymes and bacteria, begins to decompose immediately after pasteurizing. Refrigeration slows this process down. But more importantly, the loss of those enzymes and probiotics and heat alteration of the natural proteins and sugars makes the milk less nourishing to our bodies, and slightly toxic for some people. If you would like to sample our milk, please stop by and have a taste! For some excellent reading about raw milk and nutrition, please check out the links below. Info about Raw Milk and Raw Goat Milk in particular from Fias Co Farm. If you decide to come for a visit, we will be happy to show you around. AND, we would *REALLY* appreciate a call first. If no answer, leave a message!! We haven't touched it in a long time..